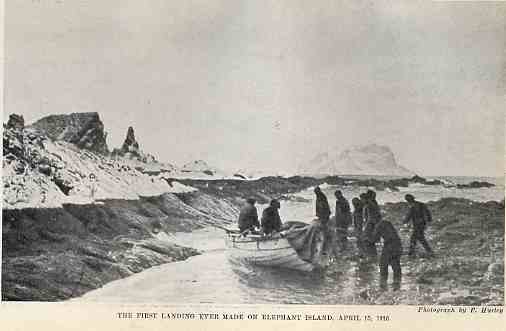 The James Caird, the Dudley Docker and the Stancomb Wills, after the first landing on Elephant Island. 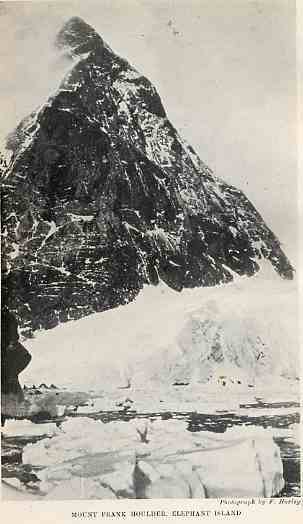 The highest point on Elephant Island. 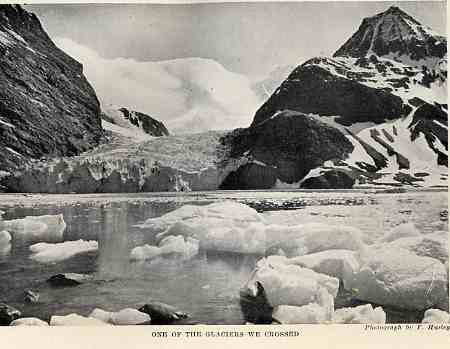 from Elephant Island. 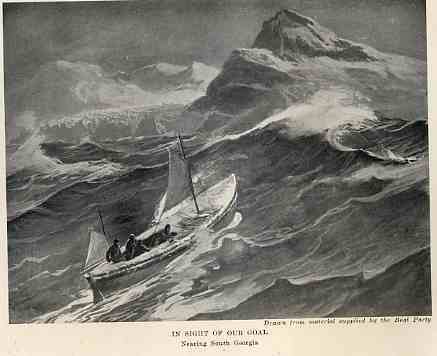 Setting out to reach South Georgia 800 miles away across the stormiest seas in the world was to become one of the most incredible small boat journeys of all time. 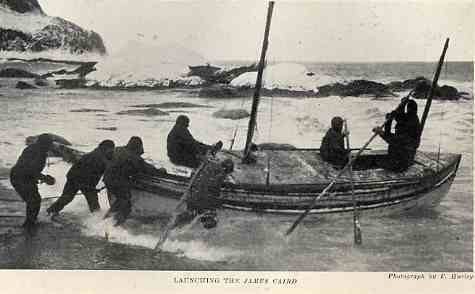 The James Caird was taken on the journey as it was the boat in best repair. 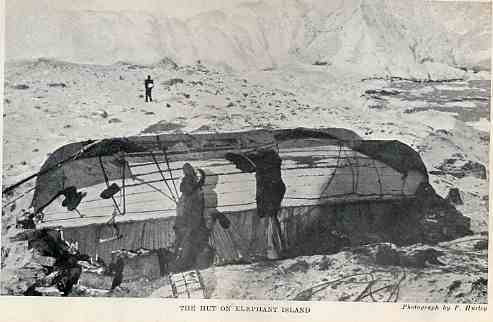 Any resources the crew had left from the Endurance were used to make it more sea-worthy, including cannibalizing some wood from the other boats. 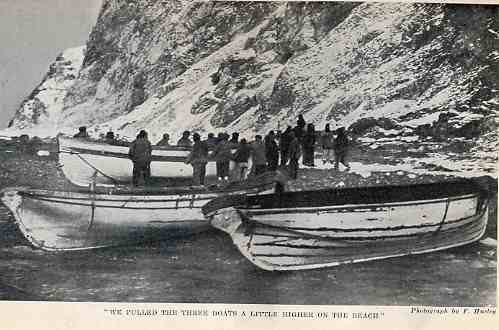 Composite photograph of the scene and a drawing of the men pulling up the boat onto the shore in King Haakon Bay. 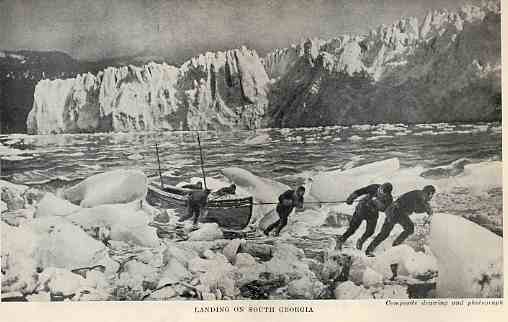 On arrival at South Georgia the 6 man crew of the James Caird were exhausted and made a camp in a cave they found. 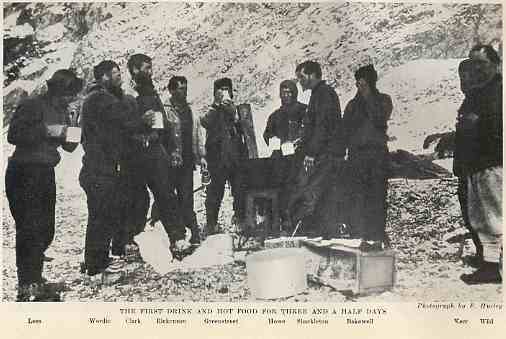 The "Albatross on nests" as marked gave them excellent sustenance. 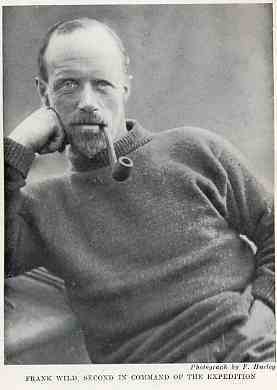 After living on ice floes and in a drenched boat from Elephant Island, the dry cave lined with grass was of the highest luxury even if it was cramped. 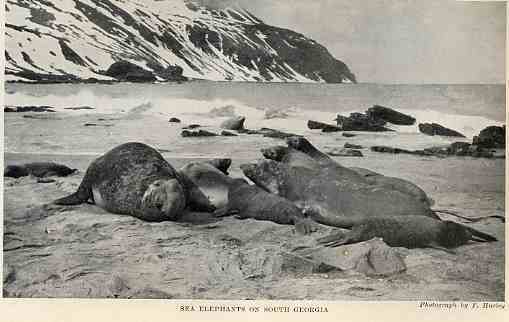 Sea Elephants or Elephant Seals are common on this island and were the target of commercial sealing for many years. About half the world's population lives on or around South Georgia. 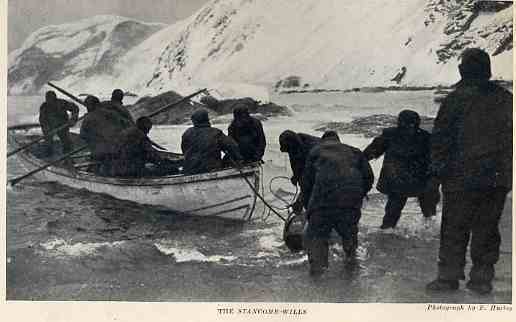 Shackleton , Crean and Worsley set off to cross the Island of South Georgia, they had landed on the wrong side to the whaling stations and were the first people ever to attempt such a crossing. 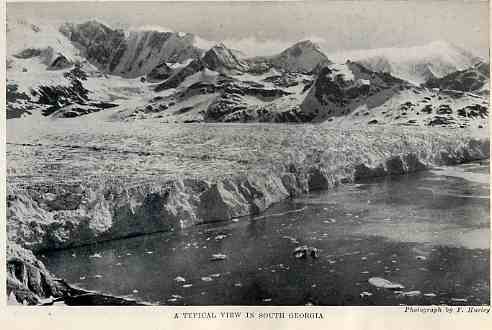 Sometimes known as "The Alps in Mid Ocean" South Georgia is a very ruggedly beautiful place. 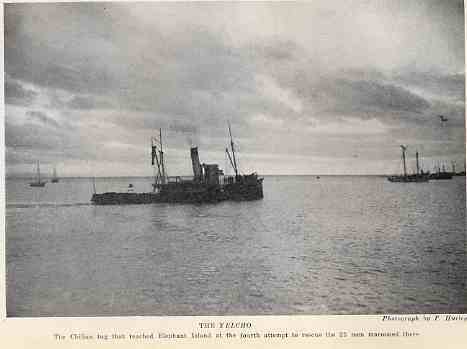 A Chilean steamer that rescued the rest of the crew from Elephant Island, the was the fourth attempt that Shackleton had made to reach his stranded men. 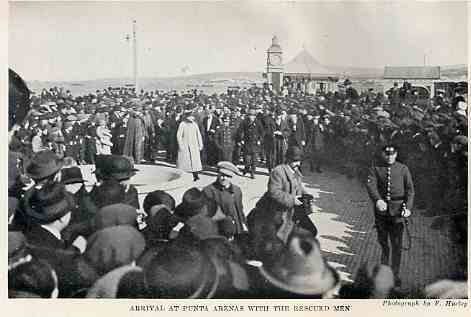 On arrival in Chile, the crew of the Endurance became celebrities and crowds gathered to see them. 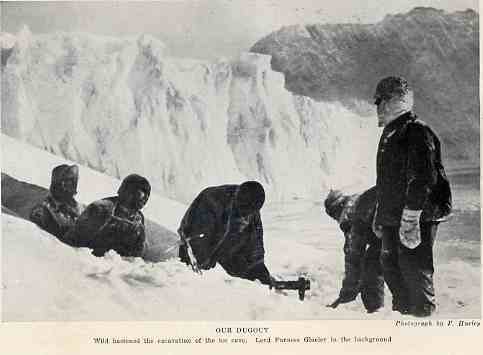 For the men awaiting rescue on Elephant Island, home was the two remaining lifeboats upturned and laid side by side, twenty two men lived like semi-frozen sardines within its cramped, dark interior. 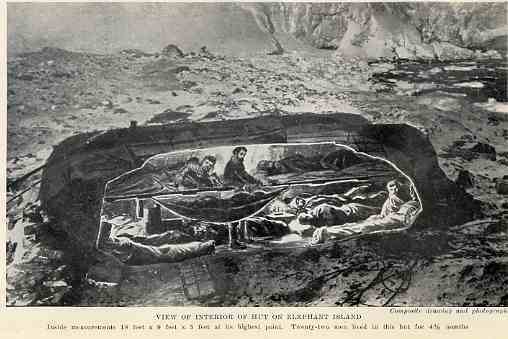 Composite photograph and drawing of the "Snuggery" or the "Sty". Inside measurements: 18 feet by 9 feet by 5 feet at its highest point. 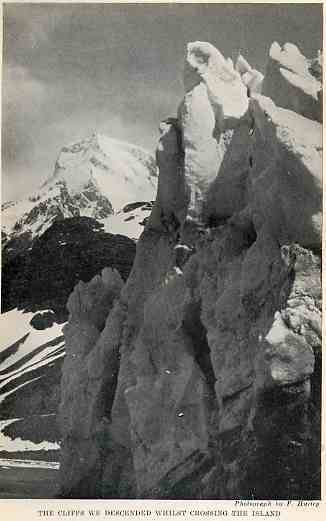 Twenty-two men lived in this hut on two levels for four and a half months.